We are always excited to introduce a new opportunity to give back to the travel destinations we love, and as Californians, we are personally all surfers at heart, whether we surf or not! A new initiative was launched at the Volcom Fiji Pro this month that will help surfers give back to surf tourism destinations. Surf Credits is a groundbreaking partnership between 3 non-profits, the San Diego State University Center for Surf Research, the Surf Resource Network, and iJourneyGreen. Here's how it works. You go to the Surf Credits website, select a destination you want to support, then select a non-profit organization working that destination you want to support. Go to the check out and buy one or more $25 tax deductible surf credits. 83% goes to the non-profits in destinations and related research. In return for the Surf Credit you get discount coupons. 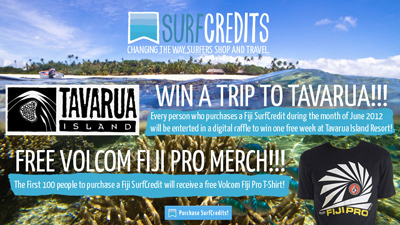 For example, the first 100 Surf Credits purchased during the Fiji Volcom Pro were emailed a discount coupon that gave them a free Volcom Fiji Pro t-shirt (value $25) through Volcom's online store. In addition, all surf credits purchased in June will go into a draw to win a free stay for two at the world famous Tavarua Island Resort! "We think this is a pretty innovate program" said Dr Jess Ponting, Director of the San Diego State University Center for Surf Research. "There is nothing else out there like this that makes it easy for us as surfers to give back to the communities and environments in the surf destinations we love. 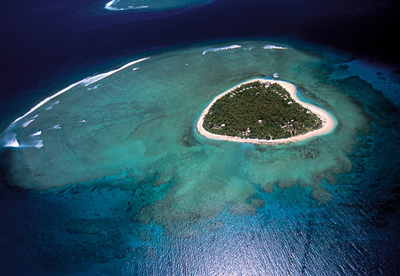 There is definitely nothing else out there that rewards you for giving back through discounts with our corporate partners and high value giveaway draw prizes like a free stay at Tavarua" said Ponting. "We're completely stoked with the reception and support we've had to this idea from the surf industry and from the surfing public. This is a program where everyone wins". You can currently buy Surf Credits for 10 surf destinations, look for this to expand over the coming weeks and months.